The following is a list of recent crashes that occurred on Interstate 90 involving semi-trucks. 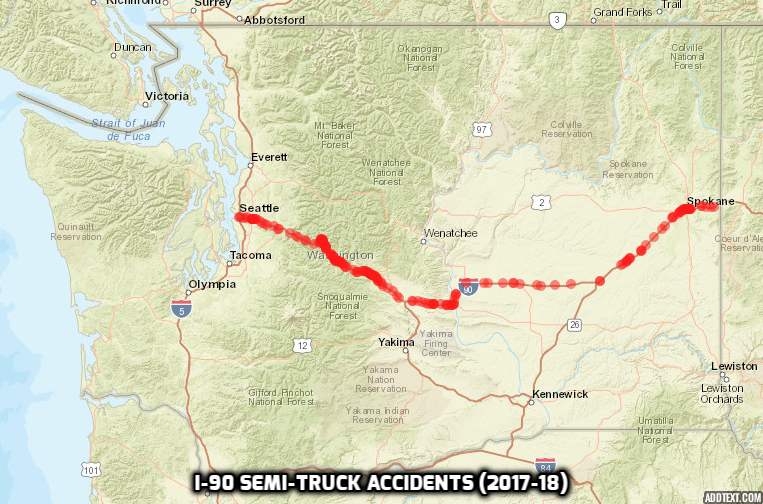 Whether the accident happened today, yesterday, last week, last month or last year, this list is for people looking for information on I-90 semi-truck wrecks. First, some data on large truck crashes in Washington State. In 2017, there were 4,098 large truck-involved crashes in the state. Of those, 52 were fatal, 84 had suspected serious injuries, 247 had suspected minor injuries, 634 had possible injuries and 3,081 had no apparent injuries. As you can see from the list below, many of the most serious incidents occurred on I-90, a 296.92-mile stretch of highway that crosses the state east to west. I-90 is the third busiest road in Washington State, behind only I-5 and I-405. An estimated 148,000 motorists use the road daily, many of them truckers. If you or a loved one has been injured in any of the below accidents, or a semi-truck crash in general in Washington State, don't hesitate to contact award-winning trucking accident attorney Chris Davis. Mr. Davis has over 25 years of experience representing victims in these serious crashes. Call (206) 727-4000, use the chat feature below or fill out the form on this page for a free case evaluation. If you've witnessed a semi truck accident on I-90 today, it may be on this list. Check back later for more details. Three vehicles were involved in a semi truck collision Monday evening outside Spokane. Injuries/fatalities: The driver of a pickup truck was killed. A dump truck, semi truck and car were involved in a collision Monday, June 25, around 3:30 p.m. on eastbound Interstate 90 near Thorp. The Kittitas County crash blocked the eastbound lanes of I-90 about 10 miles west of Ellensburg. About 200 feet of guardrail was left on the road. Injuries/fatalities: The dump truck driver has been transported to a local hospital with minor injuries. A driverless semi-truck crashed into a private family home in Edmonds on Monday afternoon, according to reports from the Edmonds Police Department. It was unclear exactly how the truck managed to roll an entire block and crash into the home. Police are investigating all possible contributing factors. The family was shaken up and there was a significant level of property damage, and firefighters had to clean up a diesel spill from the semi-truck. A semi crash on I-90 near Ellensburg blocked the right lane for several hours Monday night, according to the WSP. A green 2009 Peterbilt semi truck was entering I-90 eastbound when the driver failed to negotiate a curve and rolled. The semi came to a rest blocking the right lane of the exit. The driver was wearing his seatbelt. The cause of the crash was the driver going too fast for that section of road. Injuries/fatalities: The driver of the semi was not injured. A Washington State Department of Transportation vehicle was struck by a semi truck that failed to move over for a work zone on eastbound I-90 east of Kittitas. The right lane is blocked for this collision. Injuries/fatalities: A WSDOT employee sustained minor injuries. A truck wreck at milepost 60 near Price Creek on westbound I-90 caused a backup for miles, according to the Washington State Patrol. The delay is from the Easton area to the summit of Snoqualmie Pass. A westbound semi truck flipped. The semi was cleared around 5:30 p.m.
Two separate semi truck crashes involving elk occurred on Interstate 90 early Tuesday morning near Cle Elum. In the first collision, a semi truck was heading eastbound on I-90 around 1 a.m. when the driver swerved to avoid a dead elk in the road. The semi overcorrected to rolled on its side, blocking all the eastbound lanes. Just three minutes later and only three miles to the west, another crash happened. A semi truck and a Mazda sedan were traveling east on I-90 when the semi hit an elk. The Mazda swerved to avoid the elk, lost control and rolled on its top. Injuries/fatalities: The first collision did not result in any injuries. The second collision left the three occupants of the Mazda injured. They were taken to the hospital. Two eastbound lanes of I-90 through downtown Spokane are now open after a collision involving a semi truck, according to the Washington State Patrol. The trucking company says the driver is cooperating with investigators. The semi was hauling crushed cars, and the driver said he was cut off by a silver Chevrolet, which started a chain reaction. Injuries/fatalities: Washington State Patrol says no serious injuries are involved, but multiple people were taken to the hospital. A two-car, three-semi truck collision backed up traffic near Snoqualmie Pass on I-90 on Friday. The crash blocked the left lane of traffic. Washington State Patrol's investigation found that a 41-year-old man from University Place driving a 1998 Freightliner semi truck failed to stop in time and struck a 1999 Lexus. That started a chain reaction collision. The cause of the crash was the first semi driver following the vehicles ahead of him too closely. Injuries/fatalities: The driver of the causing semi was taken to Kittias Valley Healthcare in Ellensburg. One other semi truck driver was also injured and was treated at the scene. “Long Haul to Justice: The Accident Victim's Guide To Semi-Truck Injury Claims,” was written by Chris Davis, founding attorney of our Seattle-based personal injury and auto accident law firm, and a longtime advocate for automobile safety. 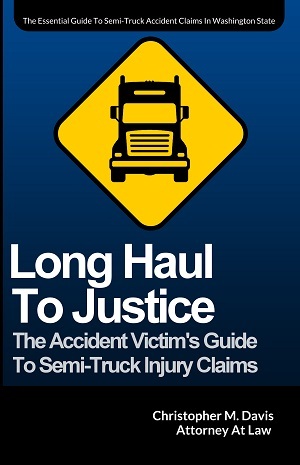 This informative book covers how semi truck accidents happen, what the victims in these accidents should do in the immediate aftermath of their crash, and how the legal casework that comes out of trucking accidents is unique. Washington State Patrol responded to a one-car, two-semi-truck collision on eastbound I-90 near Sunset Hill this morning. Expect delays. Injuries/fatalities: Injuries were reported at the scene. All lanes of westbound I-90 were blocked near Cle Elum, and have since reopened, after a semi truck rollover at milepost 88, according to State Patrol. The incident occurred around 9:30 a.m.
State Patrol said the speed limit was lowered in the area as transportation crews assessed damage to guardrails and pavement, so it could take the backup some time to clear. Injuries/fatalities: No injuries were reported. The westbound lanes of I-90 betweeen Cle Elum and Ellensburg are closed this morning after a semi-truck crash, according to the Washington State Patrol. The closure is expected to last for several hours. The incident occurred around 5:45 a.m. this morning. The semi was crashed across the westbound lanes of the highway, having ripped multiple sections of guardrail. The crash remains under investigation. State Patrol says it was snowing hard at the time of the crash. Injuries/fatalities: The semi-truck driver suffered minor injuries and was taken to the hospital. Snoqualmie firefighters responded to a semi-truck rollover on S.R. 18 under Interstate-90 at 5:46 p.m. The Washington State Highway Patrol also responded. Authorities determined that the driver of the truck had taken a turn too fast, causing the rollover. Injuries/fatalities: The semi-truck driver was not injured. Early this morning, a jackknifed semi-truck traveling on westbound I-90 near Easton blocked traffic. No further word has come out on the wreck. Injuries/fatalities: No information to report. A semi-truck drove off westbound I-90 near Kittitas, and investigators believe the driver fell asleep behind the wheel. The rollover accident occurred near milepost 115 in Kittitas. The driver had to be rescued from the vehicle. Injuries/fatalities: The driver suffered only minor bumps and bruises. He was taken to a local hospital. All lanes of westbound I-90 near Ellensburg were closed Saturday for several hours after a chain-reaction collision involving 16 vehicles and three semis, according to the Washington State Patrol. State Patrol says the initial collision occurred at milepost 88, about three miles east of Cle Elum. The crashes closed a roughly 25-mile section of westbound I-90. Officials say vehicles had trouble stopping due to the slick road conditions. Injuries/fatalities: One person was taken to the hospital with minor injuries. Their condition was not immediately available the next day. A Jeep and semi-truck collided around 3:30 p.m. near exit 31 near North Bend on eastbound I-90. The cause of the crash is not yet known. The highway was shut down for about two hours. Washington State Patrol took photos of the accident scene. A Jeep was severely crushed. Also pictured was a semi-truck that was hauling a load of vehicles. Injuries/fatalities: The driver of the Jeep sustained serious injuries and was transported to Harborview Medical Center in Seattle. Police said the driver is likely to survive. A wrong-way driver collided with a semi-truck on westbound I-90 in downtown Spokane. The driver of a Dodge Caliber entered the westbound exit of I-90 at Maple Street headed east. State Patrol said it was unclear if drugs or alcohol played a role in the crash. The wreck shut down a portion of I-90 for five hours. Injuries/fatalities: The driver of the Dodge, a 34-year-old Spokane woman, was killed. The semi-truck driver was injured and transported to the hospital. A crash involving a semi-truck closed the eastbound lanes of I-90 five miles east of Sprague, the Washington State Patrol reports. The semi-truck crashed into the guardrail. One eastbound lane was closed. State Patrol said road conditions were not a factor. A semi-truck traveling eastbound on I-90 on the Vantage Bridge struck the guardrail and spilled diesel fuel into the Columbia River. The semi was hauling a mobile home when the driver lost control and struck the guardrail. The Department of Ecology crews responded and were able to clean up the diesel spilled off the bridge into the river. It wasn't determined how much fuel spilled into the river. Traffic was backed up for several hours. State Patrol cited the driver of the semi for defective equipment. Injuries/fatalities: The driver of the semi was not injured in the wreck. A speeding semi-truck traveling on eastbound I-90 over the Vantage Bridge hit the guardrail, spilling several hundred gallons of diesel fuel. Police say the semi-truck driver reached down to use his windshield wiper fluid before he lost control. He drifted over the fog line, jackknifed and continued about 100 yards before coming to a stop and blocking both lanes. He was cited by State Patrol for speeding. A semi-truck leaked about 250 gallons of diesel fuel after it rolled over on westbound I-90 near Sprague. Washington State troopers said the crash is due to the semi-truck driver traveling too fast for the icy road conditions. Injuries/fatalities: The driver of the semi-truck is being taken to Spokane for a possible broken collar bone. 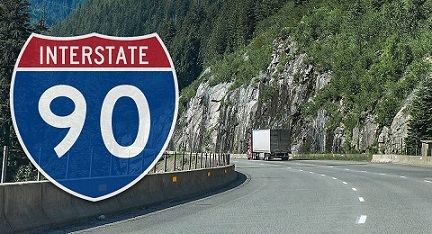 A semi-truck heading eastbound on I-90 near the Snoqualmie Pass summit collided with a jersey barrier, causing traffic backups. The Washington State Patrol report said the trailer began to "oscillate," causing the driver to lose control. The driver veered off the roadway to the right, hitting a jersey barrier at 11:26 a.m. The debris from the crash impacted two other vehicles. The cause of the crash was improper towing of a trailer, according to WSP. Injuries/fatalities: The semi-truck driver sustained minor injuries and declined aid. Washington State Patrol is looking for witnesses to a fatal crash that occurred on the eastbound lanes of I-90, west of the Ryegrass Rest Area between Ellensburg and Vantage. An investigation shows that a Dodge Ram pickup swerved to avoid an animal, crashing into a guardrail and coming to a rest on its top. It was blocking the eastbound lanes. The driver of the pickup got out of the truck. Shortly after, a Mazda Tribute struck the pickup. Then, a blue Peterbilt semi-truck also struck the pickup. Troopers are looking for the semi-truck, which has damage to the driver's side sleeper birth. A blue "access door" was left at the scene because of the collision. Injuries/fatalities: The driver of the Mazda, a 20-year-old Washington State University student from Everett, died as a result of the crash. A multi-car crash involving a semi-truck on I-90 near Cle Elum around 3 p.m. Washington State Patrol said the semi-truck was hauling a trailer and was trying to switch lanes to avoid slowing traffic ahead. The semi rear-ended a car, which then spun and hit another vehicle in front of it. Both cars were forced off the road. Injuries/fatalities: A woman died at the scene. Three others were injured, one critically. The semi-truck driver was uninjured. Heavy wildfire smoke caused poor visibility and appeared to have contributed to a four-vehicle collision on I-90 eastbound near Ellensburg. A brush fire in the median caused traffic to back up. A truck (1) slowed down for the traffic when a semi-truck (2) rammed into the back of the truck (1). The truck pulling a travel trailer (3) then rear-ended the semi-truck (2), then jackknifed and was hit by a car (4). Seven people were involved in the crash. Fire crews worked to contain the blaze, which burned about 100 acres. Injuries/fatalities: A 93-year-old woman died, and the driver of her truck pulling a travel trailer was seriously injured. A fiery semi-truck crash on westbound I-90 on the Vantage Bridge closed the highway for hours in both directions. Washington State Patrol said the truck was heading westbound when it lost control and hit the jersey barriers, causing the fuel tank to catch fire. State Patrol said the speed of the truck was too fast for conditions. A semi-truck carrying corn rolled on westbound I-90 near Easton, causing hour-long backups. The crash happened at milepost 69 around 4 a.m. There was a total of three collisions involving semi-trucks, including two that rolled. Injuries/fatalities: Minor injuries were reported. Two semi-trucks collided on westbound I-90 west of Vantage. A 2014 Peterbilt semi-truck with a tanker trailer was approaching a 2011 International semi-truck with two hay trailers traveling at a slow rate of speed, according to the Washington State Patrol. The tanker trailer semi was unable to break in time and the two semi-trucks collided. State Patrol said the tanker trailer was following too close and citations are pending. The collision led to a more than seven-mile backup on westbound I-90. Injuries/fatalities: The driver of the tanker trailer semi-truck was flown by LifeFlight to Harborview Medical Center in Seattle in critical condition. The other driver was not injured. A flat-bed semi-truck exiting eastbound I-90 near Snoqualmie Casino rolled over around 4 p.m. The truck was carrying material for homes when it flipped. The cause of the crash is unknown. Injuries/fatalities: The driver did not sustain any life-threatening injuries and has been transported to Overlake hospital. A semi-truck hauling 43,000 pounds of apples overturned on eastbound I-90 near Moses Lake on Wednesday. Pictures from the scene do not show any apples spilled onto the roadway. There is no word yet on what caused the crash. Injuries/fatalities: Washington State Patrol did not say whether anyone was injured in the crash. A semi-truck driver drove off westbound I-90, causing his truck to go over an embankment and come to a rest about four miles west of George, according to State Patrol. The semi was a 2002 Freightliner. Injuries/fatalities: The driver of the semi-truck was injured. He was flown by LifeFlight to Confluence Health-Central Washington Hospital in Wenatchee. Around 4:30 a.m., two semi trucks collided on eastbound Interstate 90 near State Route 18 west of Snoqualmie. One of the trucks was carrying a load of lumber, which spilled into the highway. Reports said it took over three hours to clear the lumber, as well as some spilled oil, from the roadway. The crash occurred during a peak time as vacationers were traveling for Memorial Day weekend. Injuries/fatalities: No serious injuries were reported. Eastbound I-90 was shut down for hours after a semi-truck overturned over the Vantage Bridge, dumping one ton of hay onto the highway. A State Patrol investigation says the semi-truck driver may have been going too fast for the curve. A pickup truck hit the hay bales. Injuries/fatalities: Three people inside the pickup truck were taken to a Quincy hospital. A semi-truck crashed and overturned on westbound I-90 near Snoqualmie Pass, blocking all lanes that direction for nearly two hours. An overturned semi truck was found at the scene. Part of its load dumped across the highway. The crash remains under investigation. Snow and slush cover the highway at the scene. Injuries/fatalities: No one was injured in the wreck. A winter snowstorm and icy roads likely contributed to a semi-truck crash on I-90 near Cle Elum. A semi-truck rolled over on top of another pickup truck in the eastbound lanes, the State Patrol said. A Volkswagen Jetta at highway speeds collided with a waiting semi-truck on westbound I-90 near the State Route 18 Interchange around 1:15 p.m. Witnesses said they never saw the sedan's brake lights before it hit the rear of the truck. Officials said it appeared that the semi-truck was waiting in a line of vehicles turning onto SR 18, but the backup had pushed onto I-90. Injuries/fatalities: The driver of the Jetta was extracted from the car. She was transported to Harborview Medical Center in Seattle with serious injuries. A collision between a car and semi truck east of Stevens Pass was stopping traffic late Wednesday afternoon. A 21-year-old Cle Elum woman driving a Subaru Impreza collided with the back of a semi-truck on westbound I-90 near Ellensburg on Saturday morning. The car then hit the guardrail on the right and came to rest in the right lane. The cause of the crash is under investigation. The woman was not wearing a seat belt, and investigators suspect drugs or alcohol played a factor in the crash. Injuries/fatalities: The woman was killed. The driver of the semi-truck and his passenger were not injured. A semi-truck traveling eastbound on I-90 at Snoqualmie pass crashed into a median, causing big delays Monday morning. The incident occurred at milepost 61, just east of Snoqualmie pass. Slick conditions due to the cold caused many accidents this morning. Eastbound lanes were close for a few hours as crews cleared the crashed truck. Injuries/fatalities: Nobody was hurt in the crash.